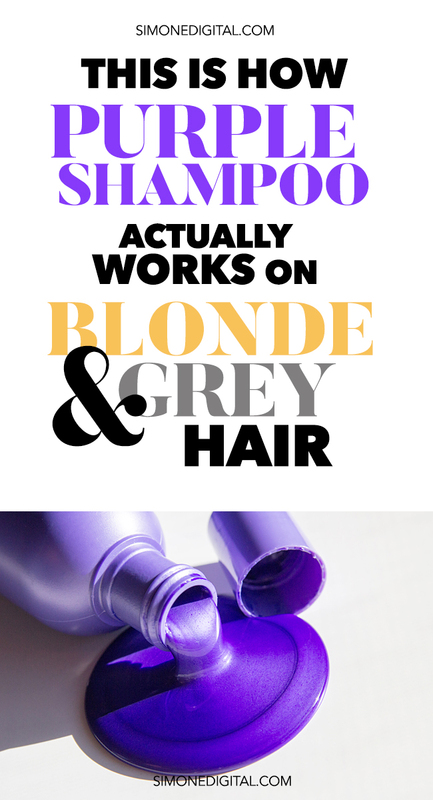 Many people with blonde hair mistakenly think that purple shampoo and conditioner will make their hair blonder but this is a misconception about how purple shampoo works on your hair. Purple shampoo is not lightener a.k.a bleach or hair color, instead it’s a purple tinted shampoo that works by toning down and neutralizing yellow hues or brassiness which in turns makes your platinum or blonde hair more vibrant and look closer to your original color shade–not lighter. When you want to cancel out a tone you use the opposite shade–just like in painting–and purple helps to cancel yellow. You don’t have to use your purple shampoo every day use. You can use it once a week or whenever you feel like your hair needs a luster boost and is becoming brassy and dull. And a word of cautionary advice from our editorial stylist, Amena: “You should avoid purple shampoos that have direct dyes in them because they can end up dying your hair purple instead of toning your hair. Unfortunately for some women, instead of toning out the warmth it makes their hair purple. Once that happens you’ll need a color correction to get it out which can be very costly. Be sure to confirm the dye type in your color balancing shampoo or conditioner product and use as directed.” If your hair is bleached platinum double check your dye source because you risk a higher chance of ending up with “Barney” hair.